Adding more white skirts might help reduce nipping. If you don't want to set up a third tank you could also see if your lfs will take them and get a more peaceful tetra. Plant the surface of the tank really well. Floating plants like Water lettuce, Hornwort, Water sprite, Anacharis and Pennywort will grow quickly floating up close to the light source and provide hiding places for bullied fish. Floating plants also make aggressive fish feel more comfortable in their surroundings. 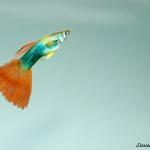 Any fish with elaborate fins like male Guppies are a target for aggressive fish. As for Goldfish, the species isn't tropical. They prefer much cooler water, around 65 degrees. I keep tanks of fancy and common Goldfish and don't use a heater in the tanks. Your tropicals will need water at least 10 degrees warmer, if you want them to stay healthy. The size difference alone would be an excellent reason for not putting Goldfish in with tropicals.